The main focus this month is on preperations for the spring. We have an excellent sellection of Fothergills Seeds, especially Vegetable Seeds all ready for selection. Our Seed Potatoes, Onion Sets and Shallots are due in early January. We sell them loose so that you can choose exactly the amount you need for your garden or allotment. All allotment owners can claim a 10% discount on purchases for their allotment. Follow this link for a list of Seed Potato, Onion and Shallot varieties available. Our Seed Potatoes, Onions and Shallots are now available. We have plenty of Indoor Primroses available individually or in baskets. 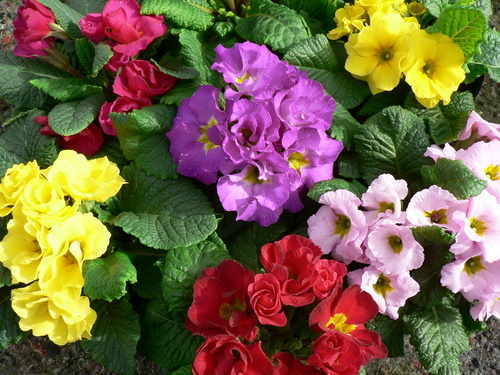 A basket of 3 Primroses costs just £4.95 from the nursery or we can deliver it locally for £9. We have a good stock of wild bird products including C J Wildlife Feeders and Bird Boxes. Our bird feeds are sold loose, we stock - Sunflower Hearts, Hi Energy No Mess Mix, Ground Feed with Raisins and Peanuts all costing £2.45 per kg, Nyjer Seed at £1.95 per kg and All Season Mix for £1.50 per kg. We also have a full range of fat product. For full details of feed mixes visit our suppliers C J Wildlife website. To claim a free Primrose please follow this link for our January leaflet.